Baking is a science. Unlike cooking, baking requires precise attention to recipe, and accurate measurements. Little things people tend to not pay attention to, like the way you measure a cup of flour, or whether you are using a liquid or dry measuring cup, can make all the difference in the outcome of your baked good. Measuring Spoons: Measuring spoons are used for both dry and liquid ingredients. Measuring spoons usually come in nestled sets of four. The most common sets include 1/4 teaspoon, 1/2 teaspoon, 1 teaspoon and 1 tablespoon. Some more unique sets can including measurements such as a "pinch", "dash", 1/8 teaspoon or a 1-1/2 tablespoon. (Be sure not to use your standard eating spoons or coffee scoop for accuracy.) Also, be sure you do not measure ingredients into your measuring spoons over your mixing bowl. It is too easy to accidentally spill or pour too much ingredient that can overflow into your recipe. Powders (cream of tarter, spices, baking powder, baking soda, etc. ): Fluff up the ingredient in it's container/box, gently scoop it into your measuring spoon and level it off. Dry Ingredients (sugar, salt, oats, etc. ): Scoop ingredient into measuring spoon out of carton and level off. Liquids/Wet Ingredients: Pour liquid (milk, water, oil, etc.) or wet ingredient (sour cream, yogurt, apple sauce, mashed banana, peanut butter, etc.) into the spoon. Level off if necessary. 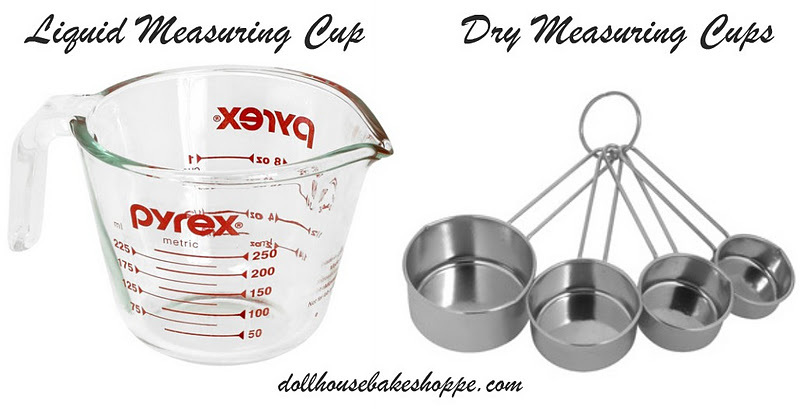 Dry Measuring Cups: If your recipes says "x cups ingredient, sifted", measure first, then sift. If your recipe says "x cups sifted ingredient", sift, then measure. Liquid Measuring Cups: Measure liquids, such as water, milk, vegetable oil, honey or syrups, in a clear glass or plastic liquid measuring cup (typically with a handle and spout). To measure ingredient, place the cup on a flat surface and check the amount at eye level. Use a rubber spatula to scrape out all the liquid if needed. Tip: For easier removal of syrups, honey or molasses, use non-stick cookie spray or grease the cup or spoon first. Flour: It is always best to weigh out your flour & cocoa powder using a scale for accuracy! If you don't have a scale, the next best method to get a more accurate measure is using, what I call, the fluff, spoon and level method (explained below). This method is especially important when measuring out your flour or cocoa powder. By scooping the dry ingredient into your measuring cup, straight from the bag, the ingredient becomes packed into the cup and will result in too much ingredient in your recipe. Too much flour will result in a tough, dense baked good, while too much cocoa powder will dry out your baked goods. This is one of the main factors in a recipe not coming out "right", and is a very common baking mistake made by at-home bakers. Fluff up the flour (or dry ingredient) in its bag or container, with a spoon or scoop to loosen and aerate it. Gently spoon the flour into your measuring cup until it is completely full and overflowing. Level it off, by dragging the a flat edge across the top edge of the measuring cup (back of a butter knife, metal spatula, etc.). Do not pack it down or shake it, as this will compact too much flour into your cup than desired. Repeat if necessary. Add to your recipe as directed. NOTE: If the recipe calls for a "heaping" cup/teaspoon/tablespoon, leave a small mound of ingredient overflowing on top of your measuring cup/spoon and do not level off the top. If the recipe calls for a "scant" cup/teaspoon/tablespoon, do not fill the cup/spoon up to the top, leaving a small gap between the ingredient and the rip of the cup/spoon. Granulated, white: Make sure there are no clumps before measuring, by breaking them up with a fork. Scoop the measuring cup into the bag/container until it is completely full and overflowing and then level it off. Confectioners' (powdered): Some recipes state to sift the sugar before measuring "x cups sifted powdered sugar" while some require the sifting to be done after measuring "x cups powdered sugar, sifted". If you are directed to sift after measuring, it is always helpful to lightly whisk the sugar in it's container/bag to remove lumps. Proceed to spoon sugar into measuring cup and level it off. Dark, medium or light brown: Make sure there are no clumps before measuring, by breaking them up with a fork. Brown sugar should to be gently packed into the measuring cup/spoon, unless recipes states otherwise. The sugar will hold the shape of the cup when it is released into your bowl but should easily be stirred apart. Fats: Liquid fat, such as oil or liquid margarine, should be measured using a liquid measuring cup or measuring spoons. Solid fats, such as butter, margarine or shortening in the form of a stick, can either be weighed or sliced according to the pre-measured marks on the sides of the wrapping (I always weigh out large amounts even after slicing according to the marks on the wrapper, for accuracy). Solid fats, such as margarine, lard, buttery spread, or shortening packaged in a tub are measured by scooping the ingredient into the measuring cup lined in saran wrap, for easy removal and then leveling off. You can also measure solid fats with the liquid displacement method; ex: If you need 1/4 cup shortening, fill a liquid measuring cup with 1/4 cup water, add enough shortening until the water level reaches the 1/2 cup mark. Since 1/4 cup + 1/4 cup = 1/2 cup, you know that your measuring cup now contains your desired 1/4 cup shortening. You can then pour out the water and use your shortening as directed in your recipe. Non-Liquid, Wet Ingredients: Ingredients such as sour cream, yogurt, apple sauce, mashed banana, peanut butter, butter, etc. should be measured using dry measuring cups and measuring spoons. Sticky ingredients can also be measured this way, but you can use a spritz of non-stick spray to avoid sticking.